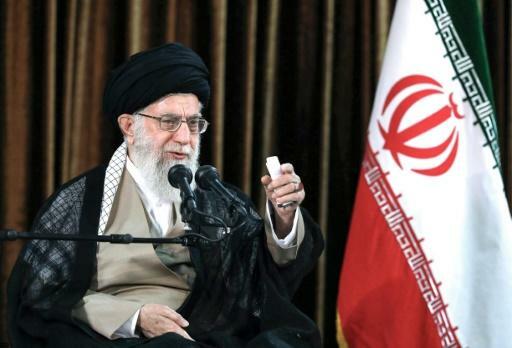 Iran's judiciary said Sunday that 67 people have been arrested in recent weeks as part of a corruption crackdown approved by supreme leader Ayatollah Ali Khamenei. More than 100 government employees have also been barred from leaving the country, spokesman Gholamhossein Mohseni Ejeie said, according to the judiciary-linked Mizan news agency. "Our enemy America has decided to put pressure on people and it intends to put our economy under pressure, but to no avail," Ejeie said. "There are individuals who try to use this opportunity and hoard basic goods and increase pressure on people by hoarding and smuggling," he added. On Saturday, Khamenei approved a request from the head of the judiciary, Sadegh Larijani, to set up special revolutionary courts to try people for economic crimes. "The goal is that the punishment of convicts of economic corruption be carried out urgently and justly," Khamenei wrote in a response published on his website. Increased pressure from the United States, including its withdrawal from the 2015 nuclear deal and reimposed sanctions, have exacerbated long-standing public anger over mismanagement and corruption in the economy. A disastrous attempt to fix the falling value of the rial in April added to the anger after the government revealed that politically-connected importers were hoarding the cheap dollars or selling them on the black market. Earlier this month, the head of the central bank was sacked and his deputy in charge of foreign exchange arrested. Corruption is deeply entrenched in Iran, where an opaque business environment provides huge opportunities for embezzlement and market manipulation.